If you want to apply a specific heading tag, first select the text or place the cursor inside it. Then choose a heading tag from the Format drop-down menu in the toolbar. 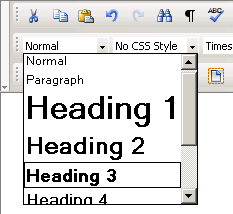 The heading will be set for the entire paragraph that contains the current selection. If that paragraph already has a heading tag applied, it will be replaced by the newly selected one.